I’m excited to have this guest post from my friend Melanie, featuring her cute baby girl! When the lovely folks at Great Pretenders introduced me to their new line of teethers I was eager for a chance to learn more about this company and review this great product. But with older children who are past the teething stage, I certainly couldn’t put this teether from their Meiya & Alvin collection to the test. Thankfully, they were happy to allow me to have a guest blogger on Mama @ Heart try out this adorable product. Thanks again, Melanie! 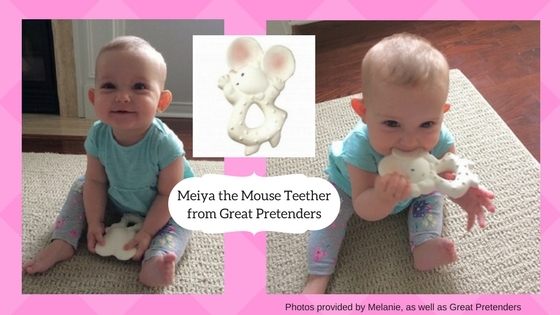 The Meiya the Mouse teether is really great! It’s a soft, all-natural, rubber material with different textures and firmness. My daughter Eleanor loves it! It’s the first thing she grabs when she’s playing on the floor. She loves to chew on the ears, which are pretty flat and fit easily into her mouth. She also likes to gnaw on the feet. Poor little mouse! One of the things I really loved is that it’s made from all-natural and recycled material and respects the environment, which is important to me. The look of the teether is adorable! Meiya the Mouse is a cute little character with pale pink and grey features. I like that it has a hole in the middle, making it easy for Eleanor to grasp and also great to attach to the toy tether that I have connected to her bucket car seat. It’s small and unobtrusive, so fits nicely in your purse or diaper bag. This little mouse comes everywhere with us! *Note: This product was provided for review. All opinions are based on personal experience. Follow Great Pretenders on social media!